The Bangladeshi nationals being deported at Sutarkandi on Saturday. At a time when BJP government is making all out efforts to pass the Citizenship (Amendment) Bill, 2016 in the parliament to grant citizenship to Hindu Bangladeshis, at least 21 Muslim Bangladeshis were deported to the neighbouring country on Saturday. 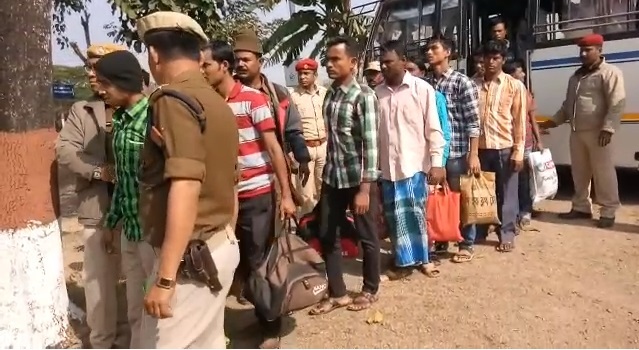 The 21 Bangladeshi nationals including two women, who had entered Indian territory through the porous border in Dawki and Dona in Meghalaya and through Tripura, were earlier arrested for violation of the Passport Act. The controversial Citizenship (Amendment) Bill, passed in the Lok Sabha on January 8, seeks to provide Indian citizenship to non-Muslims from Bangladesh, Pakistan and Afghanistan, even if they do not possess any document. They were handed over to the Bangladesh Rifles and Bangladesh Foreign Ministry officials by the Assam Border Police Force and Border Security Force (BSF) at Sutarkandi on the outskirts of Karimganj district. Sources said they were deported to Bangladesh from the Sutarkandi Immigration Check Post (ICP) in Karimganj district. Karimganj SP Gaurav Upadhyay informed that all the Bangladeshis were held on different durations and were deported after detailed verification. They were lodged at Silchar Central Jail and Karimganj District Jail. “All of them have served their sentences of two to four years for illegally entering India and after completing the immigration process of the detained Bangladeshi nationals they were sent across the international border in the afternoon today,” SP Upadhyay said. The deported Bangladeshi nationals were identified as Nasir Hussain, Abdul Wahid, Khairul, Musst Jahida Begum, Musst Sufia Begum, Mihir Pebel Mia, Safique Islam, Saveel Ahmed, Ramjan Ali, Bablu Ahmed, Suman Fakir, Mausam Ahmed, Nazim Uddin, Ashraful Alam Choudhury, Litan Ali, Md Tofique Ali, Md Raju Ahmed, Dilwar Hussain, Sukkur, Shamin Ahmed and Rubel Ahmed.